Home » Blog » How to access and travel your own dimensional highway? In this exquisite journey on earth your soul incarnates through a soul channel. This soul channel is your highway through the different dimensions. Let’s start with the question: in which dimension do you live in? The picture shows us the different dimensions as described in our previous article and the three different possible positions to live in. We can live in the third dimension (3D), the person at the left side of the picture. When we are confined to 3D, we appear to forget the access code for the other dimensions. We often believe we can only return to the spiritual world after death. We are sometimes even convinced that the human world represents hell and the higher dimensions heaven. We can also completely live within the spiritual dimensions as the person in the middle of the picture shows. This person has accomplished what we consider enlightenment. There is however no connection left with the earth-bound dimensions and the treasures and opportunities of life as a human being. We can also live positioned in the fourth dimension (4D), the person at the right side of the picture. We are captured in the powerful flow of consciousness which may offer us an entry into the higher vibrational levels and we might become lost in the lower vibrational levels. Within the whole continuum of vibrational levels there is the possibility of what might be called psychotic symptoms and episodes. A psychotic symptom or episode can be a channelling of a higher vibrational being, an awakening, an hallucination, a delusion or a split personality. And between these three extremes there are endless positions available to you. How can you understand where you’re living and how can you find entries into more dimensions? • The meaning of dimensions for a physical body. • What is the “I” that knows? • How is the “I” connected with your soul? • What is your soul’s purpose? The next step on your journey with your experience of life as a human being, is the understanding that your body functions holographically within the intelligent design of the earth and all life on it. This means that your body is surrounded and permeated by the same dimensions which surround and permeate the earth. Your body can access all those same dimensions. With their consciousness, the earth and your body contribute to the dimensions which surround them. This is a bold statement and a very important one! They ceaselessly contribute with their intelligent design to the evolutionary purpose, to the wholeness and the self-management of the bigger whole. The earth and your body are continuously affecting and being affected by the earth-bound and spiritual dimensions. So you see, the earth and your body are not simply playthings at the mercy of a powerful universe. What is the “I” that knows? You arrange your life through an “I am” that can take decisions, feel, think, understand, conceptualize. This is what we generally call our personality. Your personality is the combination of characteristics that help you to manifest your self, and through which you playfully weave the tapestry of your self. Let us weave your personality or your day-to-day “I am” into what has been discovered about the dimensions. This definition of your personality fits with the third dimension, your day-to-day reality with the possibility of weaving a very colourful tapestry. How is your personality connected with your soul? This is an important question and will define where you live in the dimensional picture. 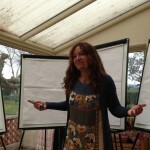 How big is your personality, how much of the multidimensional capacity, so to speak, can you occupy? Your personality is a part of your mind. How do we define your mind? 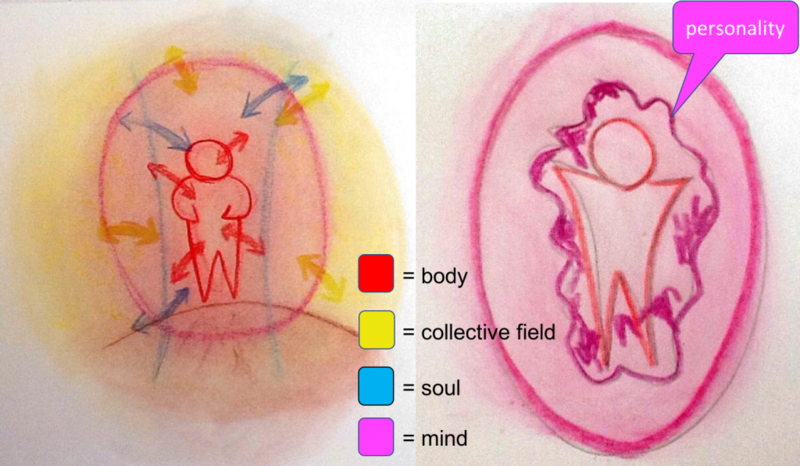 Let’s look at the image above on the left: the soul (blue), body (red), mind (magenta) and the collective field (yellow). 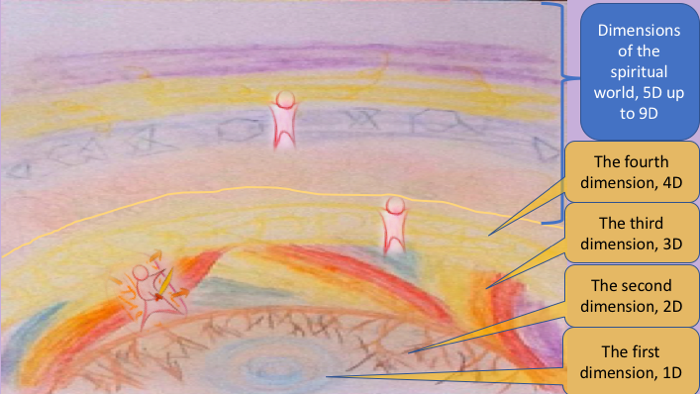 There are arrows indicating the ongoing exchange between your soul, your body and the collective consciousness. You could say that the mind is a result of this exchange in energy consciousness. As mentioned in the first section of this article, the body brings to this interaction its own consciousness and the impact of the dimensions which surround and permeate it. The mind organises itself as an energy field permeating the body and extending far out. Through its intelligent design your mind is an amazing tool to experience life as a human being. Many traditions and healing schools call the mind, as we are defining it, the aura or the human energy field. Your personality can become very big and encompass a great deal of your mind. Most of the time your personality is only a part of your mind – it is the day-to-day aspect of your mind. However, your personality can become very big and occupy much of your mind. When you return to the picture above at the right side, you can see that your personality is in constant interaction with the collective field. There is a strong connection between your mind and your soul. Your soul is an immortal aspect of you. Your soul is a record of all your feelings, emotions and actions throughout your entire life and all of your other life experiences. 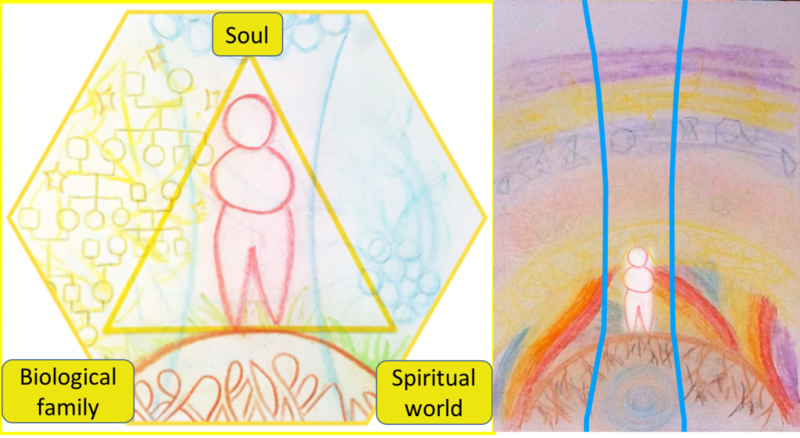 The picture above on the left shows you the triad card of the ChancesToChange board game representing your soul, your biological family and the spiritual world. Bringing your attention to the soul and its channel, you can see a representation of this channel as a blue vertical column (the picture above). Your soul comes with an agenda, a script of what you desire to experience in this incarnation. This script is your soul’s purpose. The channel of the soul is your intention to come and live your life to the fullest, to fulfil your soul’s purpose. The channel grounds your soul into the earth and keeps your soul connected to the spiritual world. The picture above shows how this channel surrounds your body and connects you to all the dimensions. Your soul channel is the answer to the question of how to access different dimensions. This solution is always available to you in your life as a human being. What an extraordinary journey your life on earth is as a spiritual being! This article brings light to your multidimensional perspective. Everyone has the possibility to choose to become a multidimensional being. What an insight! The next series of articles describes how the ChancesToChange board game assists you to experience and visit these different dimensions through your own inner highway, your soul channel. How can you access your soul channel and start your journey? By listening! We will start the “art of listening” by listening to the collective consciousness. Dear ones stay connected and please engage and comment. Bio Veerle De Bock: Each day I add a bit more colour to the world, I colour within and outside of the lines as I take up different roles. My different roles are a social entrepreneur, a physician, a coach, a teacher, a therapist and most of all a facilitator of emerging possibilities. Link to extensive bio.